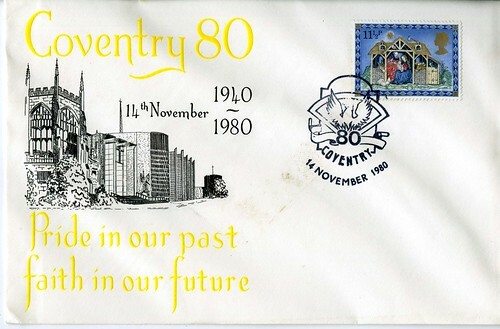 Coventry '80 was an event organised by the citizens of Coventry to commemorate the blitz of the city on 14th November 1940. Pride in our Past, Faith in Our Future aimed to remember the city's destruction with sorrow for the losses and thankfulness for its resurrection but also to look to the future with realistic hope. This commemorative cover depicts the east end of the ruins of the old Cathedral which was destroyed on 14th November 1940, with the 'south' side of the Cathedral built alongside and consecrated in 1962.